Hurry up and call for this spacious 2 bedroom, 2 bath, plus loft, townhome! This cozy canyon cutie will not last long. At 1316 sqft this Patio Home in Ventana De Sabino has everything you need! Covered parking, Private Courtyard, Extra Storage, Vaulted Ceilings, and a huge Master Suite with a loft that is just perfect for an office! You will love driving to and from home as you take in the gorgeous Sabino Canyon Views along Sabino Canyon Rd and Sunrise. Enjoy starting your daily commute with the tranquility of the sunrise against the Catalina Mountains and come home to peaceful skies painted with our famous desert sunsets! As you pull into your designated covered parking right in front of your private patio you will be welcomed by colorful and attractive landscaping, including purple lantana and your very own citrus tree. The Patio is brick and concrete and faces northeast, with it's covered Saltillo tile awning it is perfect for enjoying the Tucson weather without getting to much direct sun in the summer! Moving into the home you will find the open concept floor plan with the living area and dining area next to each other and both featuring huge vaulted ceilings that give the home a light and airy feel. The dining area is next to the kitchen, which continues the open floor plan concept with a wide pass through for easy entertaining and up-lighting that illuminates both the dining and kitchen areas. As you move past the kitchen into the hall you will find the laundry closet on your right with shutter style doors and a full size washer and dryer along with extra shelving up top. Directly to the left of the laundry closet you will find double doors opening onto a gigantic under-stair storage area with plenty of room for coats or seasonal items. Moving further down the hall just past the laundry room you will find the guest bathroom with a shower/tub condo featuring a tile backsplash and flexible shower head. The guest bathroom is right next to the downstairs bedroom. The downstairs bedroom has excellent lighting through the community facing window and features a double door wall closet. This room features soft neutral colors that create a warm and inviting ambience. Moving out of the guest bedroom and upstairs you will find the large loft area and Master Suite. The Loft overlooks the dining and living area and features and easy to access ledge for additional storage or decorative purposes. The loft has a small nook area just against the stairway that is the perfect spot for a desk and home office or even a small additional sitting area or space for a futon for extra guests. The loft also features plenty of natural light through a skylight. Moving to the right of the loft you will find the master bathroom with a double vanity sink and a walk in shower, also featuring tile backsplash and a flexible shower head. Moving to the left of the master bath is the master bedroom with a large and open feel created by vaulted ceilings and there is a continued abundance of natural light via the large southeast facing window. The south side of the home features a formal entrance with small alcove patio and overlooks the community courtyard with lush green grass and fountain portico. To the left of the fountain area you will find the club house and pool and spa, as well as outdoor dining and cooking facilities. Just to the west of the home you will find the tennis courts. Ventana De Sabino also features plenty of walking trails and is right next to the Sabino Canton Recreation Area. 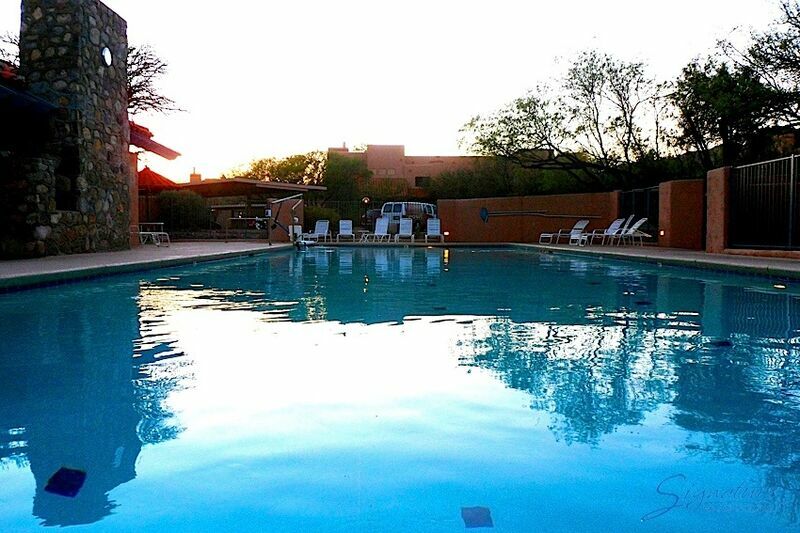 Nestled right in the heart of the canyon base you have privacy and peace, all while being close to shopping and dining options at Sunrise and Kolb or Sabino Canyon and Tanque Verde. Don't miss this opportunity for the perfect place to call home! Contact Brisa with Signature today! at 602-888-9106 or 928-310-3670.